The other day, we made a recipe that called for baking sweet potatoes. Well we ended up with more than we needed, so I pureed some to make these Chocolate Sweet Potato Muffins. These are delicious. Dense, fudgy and filled with little bits of pecans. Marcus has been taking them to work all week. This recipe is easy and freezes well too. If you like chocolate, you may also like my flourless chocolate muffins and my chocolate coffee cookies. This healthy muffin recipe is vegan and gluten free. If you are trying to get some more veggies into your kids, this is a good one to start with. Mine had no idea there was sweet potato in it! 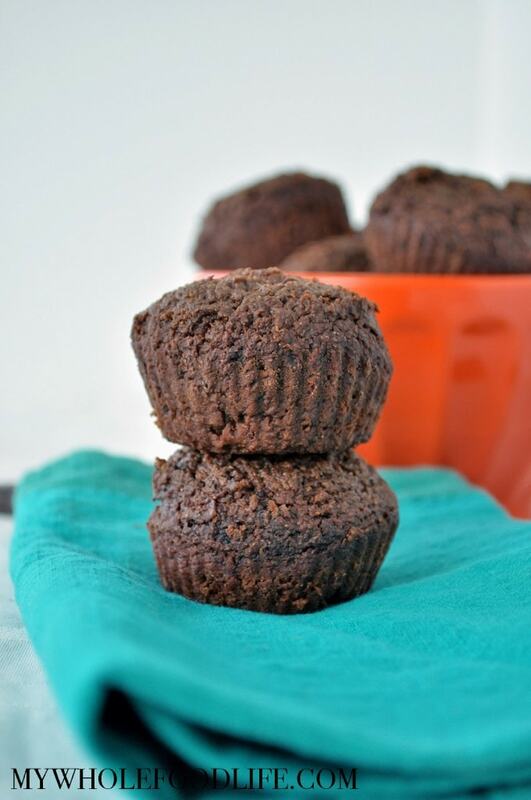 A chocolate muffin with a hidden source of veggies! In another bowl add the wet. Using a large cookie scoop , spoon batter into lined muffin cups . Bake for 11-13 minutes, or until a toothpick comes out clean. Store in an airtight container in the fridge. They should last at least 7-10 days. You can also freeze them for up to 6 months. Hi Melissa, I am unsure if it is just my machine, but there is only a white box in front of the word maple syrup, so I cannot see the amount needed for this recipe. Can you please share that? Thank you! The white box in front of maple syrup is showing up for me, too! Glad to know it's 1/3 cup so now I can make these. Is there a substitute for maple syrup? It is very expensive in my country. I like your recipes but unable to try those ones with maple syrup because of that reason. Thanks a lot Melissa. Tomorrow I start my baking. I've tried the overnite oats recipe. Absolutely delicious and addictive. So glad you like those! Do you think I could sub almond or whole wheat flour for the oat flour? Or should I grind oatmeal to make the oat flour? You can definitely grind up rolled oats to make oat flour. That's what I do. Almond flour may work, but I would add an egg to help bind. Let me know the results if you try it. These look super super yummy. Although I am curious... how do you stop yourself from just eating up any leftover sweet potato there and then....? Is it possible to use coconut flour instead of the gluten free flour? Coconut flour is not any easy sub. It’s best to use it only in recipes written for it. Hello! Is it right that you don't need any plant based milk or egg substitute for the recipe? I'd love to try these muffins; they look amazing!